Hi! My name is Nicki and I live with my husband and our West Highland White terrier in a 17th Century stone cottage in the Northamptonshire countryside. I love coffee, puppies, chocolate and Grey's Anatomy. Having spent 18 years in the publishing and business banking respectively, I took the decision in 2015 to leave my role in finance and pursue something more fulfilling. Following the financial crisis in 2007 the world of banking changed and my role adapted to accommodate new regulations. There were less events for me to organise and less opportunities for me to meet customers. There was more monitoring to be done; more spreadsheets to complete. I had less one-to-one connection with colleagues and I started to feel like just a number. I was exhausted and mentally drained yet felt I had no real purpose in life. Embroidery provided respite from the worry and stress of everyday life. I felt proud of the results I could achieve with needle and thread, enjoyed the friendship I found in the online stitching community and came to rely on the ritual of sitting down with my hoop to clear my head whilst producing something delicate and decorative. Stitching forced me to slow down and unwind; it helped to relieve depression and calm my mind. I have been selling my work for a couple of years now and I feel more passionate than ever about the craft. I have developed an obsession with muted colours, antique fabrics and old lace. I don't go anywhere without a small project to work on; there is usually time to add a few stitches to a piece whilst waiting in a doctor's surgery or chatting with a friend over coffee. It is my way of achieving mindfulness every single day. 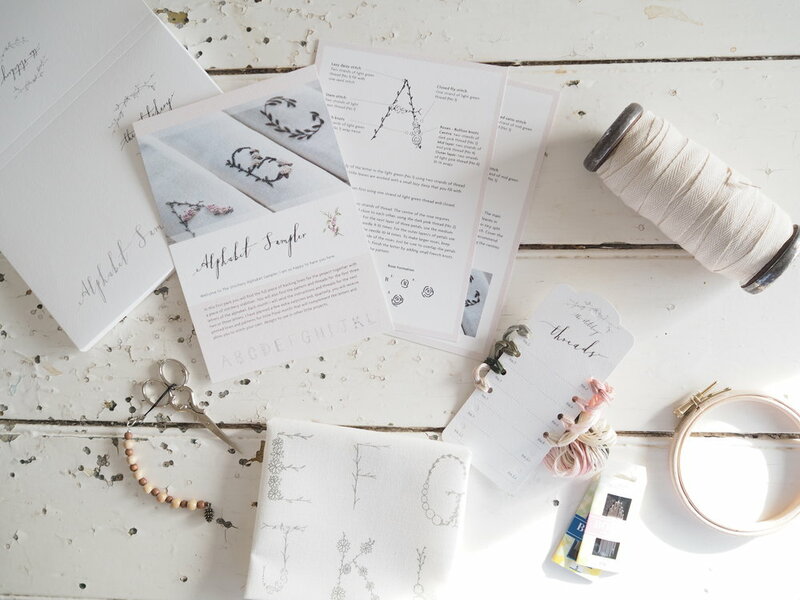 With The Stitchery monthly subscription box and standalone kits I can share my skills and enthusiasm whilst connecting like-minded individuals across the world using social media. The group of Stitchery Stitchers is growing every day; supporting and encouraging other as they learn new stitches and complete patterns they thought beyond them. I send happy post and I host embroidery classes where people can get away from the daily grind and spend a day relaxing, doing something just for them. This all puts a huge smile on my face and, I hope, will make you smile too. Thanks for stopping by.